I’ve been trolling Pinterest a lot for Easter inspiration (you can check out my Pinterest Easter board here). 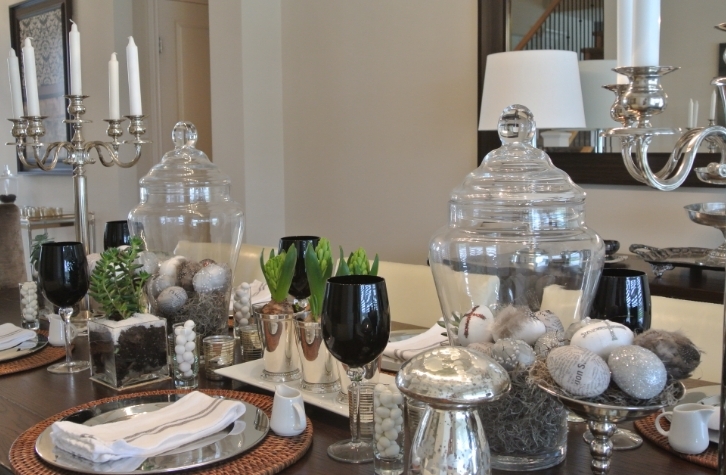 Pastels and the usual Easter colors don’t work well in my black, cream and gray dining room, so I was looking for something more natural….maybe even French rustic. Here’s what I came up with using a lot of the things that I already had at home! 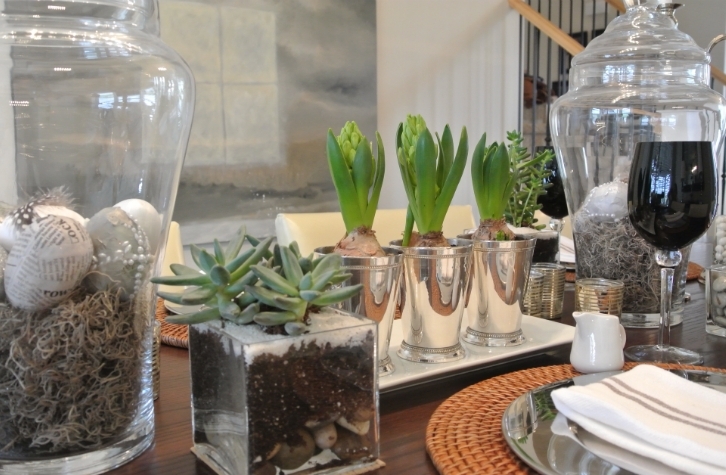 I used neutral colors, black stemware, mercury glass and hits of green with the succulents and hyacinths. My girls and I decorated styrofoam eggs that we bought at the dollar store with newspaper, glitter, tissue paper, feathers, pearl stickers and metallic Sharpies! I had purchased these silver mint julep cups a few years at Hudson Madison. 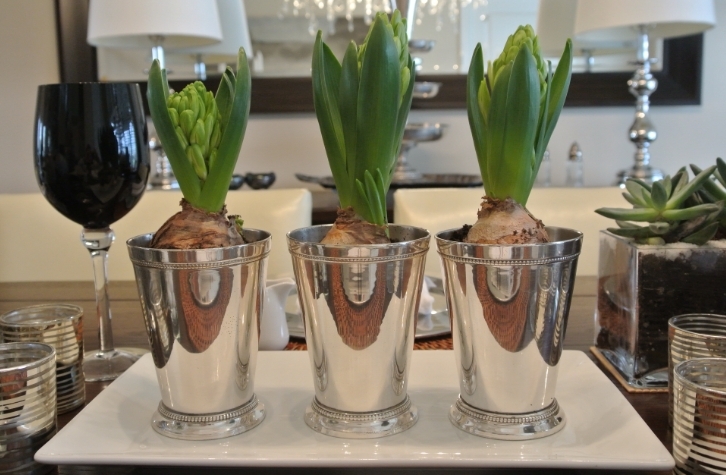 I think they are quite simple, yet elegant, with hyacinths in them (the blooms will be white). I purchased 12 of these stainless charger plates a few years ago….I can’t count how many times I’ve used them…such a great investment! I also wanted to incorporate succulents…they are so popular right now! I love the organic feel that they add to the table and they are supposed to be easy to maintain…we’ll find out! 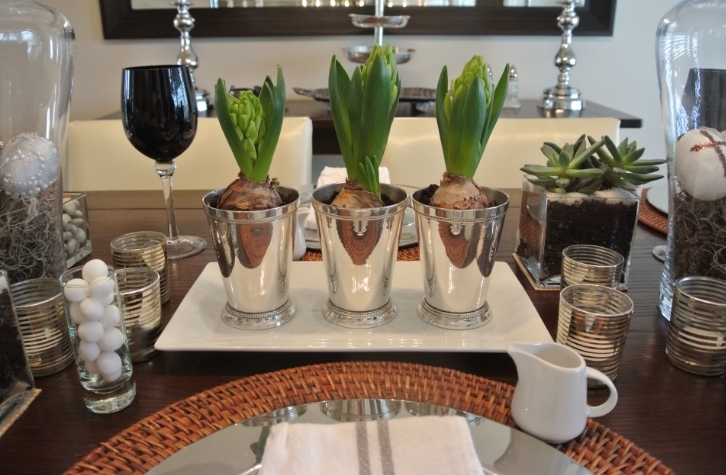 We…ok, actually, Jason transplanted them into square vases that I had (I don’t have a green thumb!). He put rock on the bottom, dirt, and then I added white sand on the top. 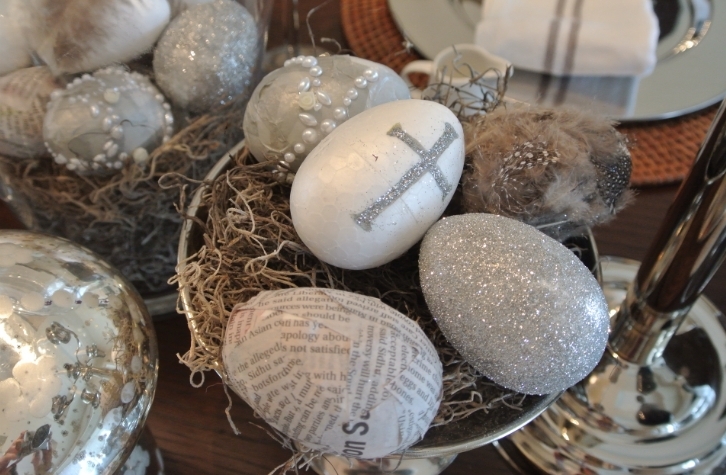 And the great thing is that once Easter is over, I will use them in my family room or bedroom! 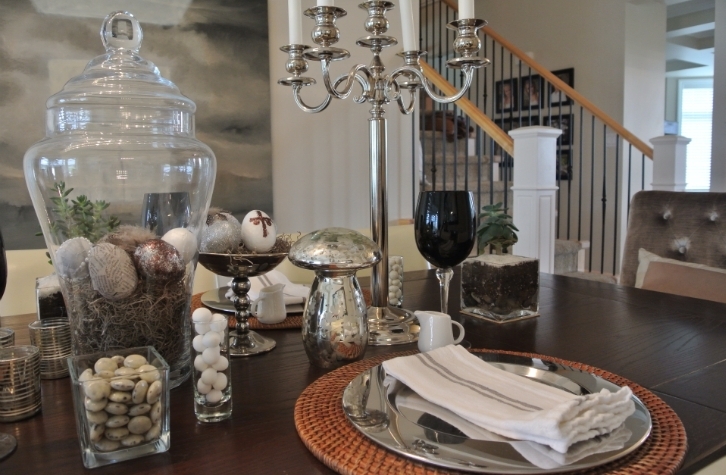 In keep with the color scheme, I added shot glasses and votive holders filled with white and cream candies…Scotch mints, yogurt covered raisins, malted eggs and Hershey’s Cookies ‘n’ Creme drops. I created this natural Easter look mostly with stuff that I already had…I tried to think creativity how to re-purpose things and use them in a different way! Wishing you a very Happy Easter from the sisters!